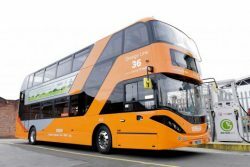 With its 53rd biogas bus, the world’s largest fleet of biogas double-decker buses is now fully operational in Nottingham. The engines and chassis of the new buses have been developed by Scania with bodywork by Alexander Dennis Limited. With all 53 the biogas double-decker buses now in use, over 3,500 tonnes less CO2, 35 tonnes less NOX and 0.75 tonne less particulate matter will be emitted each year from the fleet, delivering significant improvements to air quality in Nottingham. With plans for further orders of biogas double deck buses and to convert 185 existing buses to the latest Euro 6 emission standards, Nottingham City Transport is on track to reduce emissions by 90 percent by 2020.